Our lineup of superior quality, heavy duty fiberglass polymer composite detectable warning surface tiles are manufactured in a state of the art ISO 9002 certified facility located in Northeast Ohio. Having an ISO 9002 facility allows us to provide our customers and business partners with superior products; through a sophisticated quality management system from start to finish. ADA Solutions’ products are UV stable with homogenous color throughout the entire panel. Our panels contain premium quality long strand fiberglass in the base material – (25%). During the sheet molding process the fiberglass is blended into the base material during the mixing process and evenly disbursed throughout the entire body of the panel and into the truncated domes we all recognize. This is a critical feature because the truncated domes are the primary point of contact to us as we walk, and are subjected to the highest degree of exposure to foot traffic, rolling apparatus, and street cleaning equipment. Available in both cast in place and surface applied forms, radius systems are designed to be placed along walkways, curbs, and more to alert the visually-impaired. Panels are manufactured with ADA-compliant radius truncated dome panels. Designed by ADA Solutions, Inc. to be Contractor friendly and aesthetically pleasing. A durable tactile warning product that is permanently embedded into freshly poured concrete. Cannot be removed without demolition of existing concrete and pouring of fresh concrete for new detectable warning panels installation. A time tested and proven option. Made with the same best in class material the game changing market innovation released by ADA Solutions, Inc. is the only product that is 100% replaceable. An incredible cost – effective benefit when implementing public accessibility plans. Surface applied tiles can be easily retrofitted into existing concrete surfaces. These detectable warning surfaces are firmly secured with Chem-link M1, a strong structural adhesive, nylon sleeve anchors and stainless-steel pins. As the leading manufacturer of detectable warning surface products in the United States, ADA Solutions is commited to supporting safety and accessibility in every project. We’ve provided long-lasting replaceable cast in place tile – dry or wet, truncated dome mats, and more to contractors, engineers, architects, and distributors for over 20 years. Thanks to our stringently-tested products, friendly sales staff, and dedication to customer service, our loyal customer base continues to grow—we hope you’ll give us the opportunity to make you a believer, as well! Contact us today to receive a free quote for detectable warning tiles for support and technical guidance on your next project. All orders ship within 6 to 36 business hours from receipt of purchase order without error or delay 99.45% of the time. We have the largest network of fully trained and well stocked distribution network in the industry. Our dedicated staff of industry experts is available at all times to assist you in every possible way. No phone call goes unanswered. Our customers mean everything to us. We take great pride in the providing complete and accurate responses in a timely fashion. Each year we install more fiberglass polymer composite detectable warning than all other alternative suppliers combined. This competitive advantage allows us to sell heavier, thicker and superior attachment components at the same or lower price than our competitors. All of our products meet the requirements and standard set forth under the Americans with Disabilities Act of 1992, The Public Rights of Way Accessibility Guidelines (PROWAG), California Title 24, The International Standard Organization (ISO-2555), Canadian Standards Association, Accessibility for Ontarians with Disabilities Act and the World Health Organization. 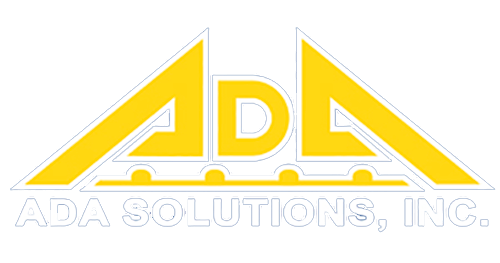 ADA Solutions, Inc. offers the longest warranty in the industry for a reason. Our best-in-Class detectable warning and way finding panels consistently last years longer.We take great pride in our trade and stand fully behind our products and loyal customers that have come to rely on them.